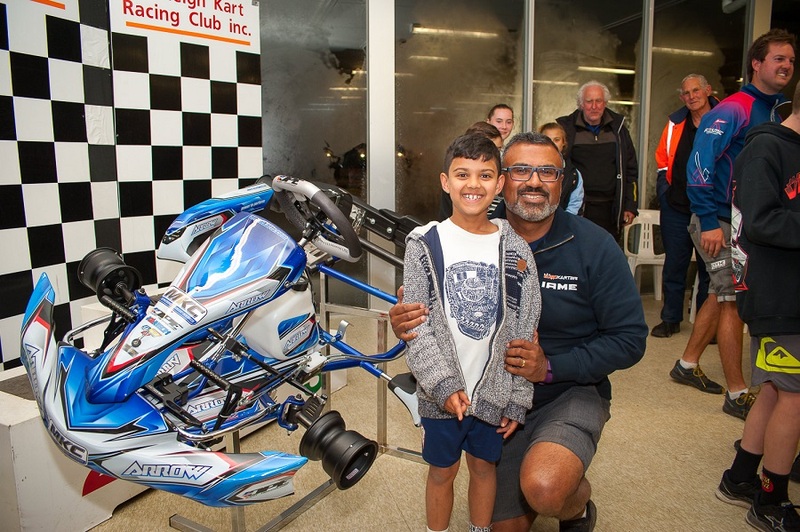 The April Club Day of the Oakleigh Go Kart Racing Club is this Sunday (29th April 2018). Please check the details on the Race Entry page for more details. The Monash University team will be using the track and facilities at Oakleigh this Thursday March 8 2018 from 7:30am to 5:00pm. The track will be available for OGKRC members to use as normal. The first club day of 2018 is finally here. Head over to the race entry page to view all race day details. Due to the unavailability of key personnel on Saturday 24 2018 we have had to change the February Club Day to be Sunday 25 2018 (Day Meeting Only). We apologize to our members who may have made arrangements or wanted to run under lights but unfortunately without Officials we are unable to run our race meetings. Here we are for Day 2 of Junior Top Guns in 2018 – a cloudy Saturday with a forecast that includes the phrases “rain” and “hail” – so look out! There might be more exciting weather on the way. We also need to thank the generous sponsors of our Top Guns meeting who include Page Bros RV, Baron Karts, Melbourne Kart Centre, Kerbrider, Kingston Trophies, J&A Kart Tuning, Shamick Racing and of course DPE Kart Technology for their generous donation of the Arrow chassis that will be drawn following tonight’s presentation – their support has covered many years of Junior Top Guns. See the end of the report for details of the lucky winner!! Also the shots that are part of the report are provided by Andrew Daley of AKD photography – see more of his work at AKD photos on the internet. I don’t think anyone turned a wheel with a slick on it last night, so let’s hope we get at least some dry racing today. 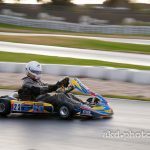 Qualifying began on a wet track but the rain had stopped, by the time we went racing it was damp but not raining. Note that at the end of each class I have listed the overall winners who are decided by the results from both nights of racing. Please also note that while the combined results are confirmed, the report itself lists karters as they crossed the line and subsequent penalties may have changed the race result. Here we are again at Oakleigh in January – it’s Junior Top Guns time. I found myself reading the start of the 2017 Friday report when I got to the track today, and was struck by the similarity in the weather a year ago – humid, hot, and then just as Qualifying was getting set to begin it poured with rain – same in 2018. By the time Clerk of Course Adam Bourke finished Drivers’ Briefing today he was shouting to be heard above the rain drumming on the grid roof. Better than the days when we didn’t have a roof I guess! This must be about the 15th year Oakleigh has run Junior Top Guns and it remains a great way to kick off the year. 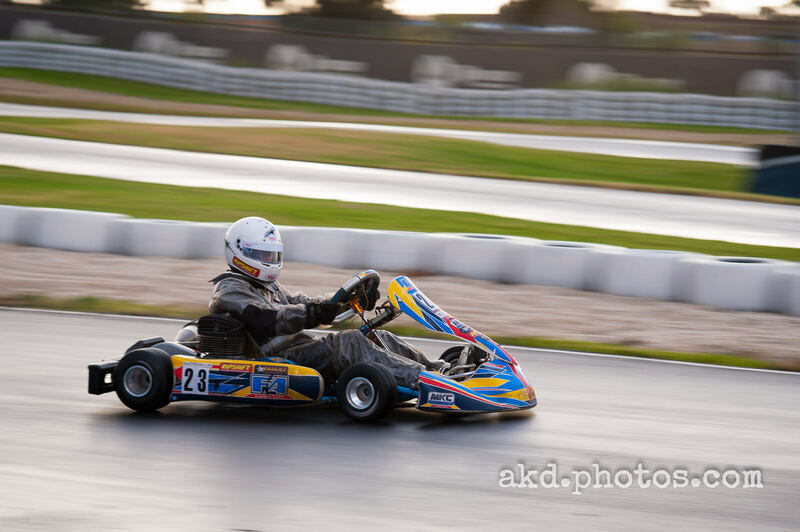 Young karters get the chance to race under lights and generally blow the cobwebs out. Lots of competitors have gone on to bigger things. 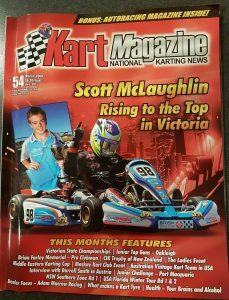 I can remember watching Matthew Brabham race Junior Light here and Junior Clubman; many others have had a crack at Top Guns at Oakleigh and below I have included a shot of a young Scott McLaughlin in his 2008 breakout year in karting. 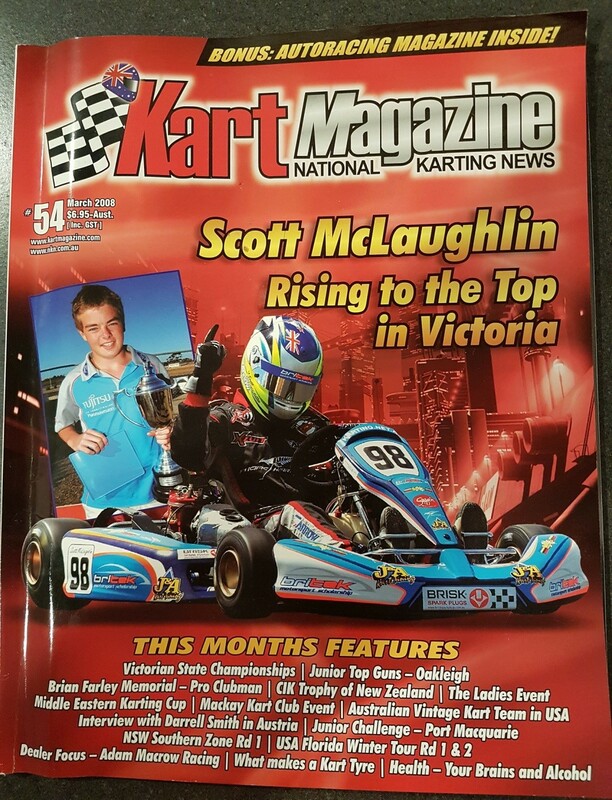 He began the year by winning Junior Clubman at Oakleigh’s Top Guns then went on to win the Vic Open in the same class – and has since done one or two other handy things in motor racing! Who knows what the future holds for this year’s KA3 winner. In the lead up to the 2018 Junior Top Guns races, the track will be closed to all senior drivers from 5pm Wednesday January 10 2018. The track will reopen for normal use on Sunday January 14 2018. The 2018 racing calendar has been updated. The track will be closed from 7 pm Tuesday January 9 2018 for urgent track maintenance. It is expected that the track will reopen as normal at 8 am Wednesday January 10 2018. Entries for the 2018 Junior Tops Guns are open, and the supplementary regulations are available for download.